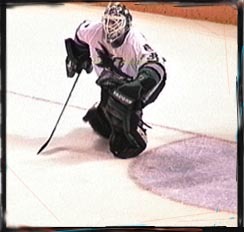 Sharks Goalie Wade Flaherty is just outside the crease after clearing the puck down the ice. Just how fast is a goalie's reaction time? Describing motion is a part of mechanics known as kinematics. Physicists call this a kinematic equation. 90 x 5280 = 475, 200 feet per hour. This doesn't allow very much time for the goalie to move himself and all that equipment over to save the puck. Try testing your own reaction time, for a better understanding of what a goalie has to do. You can measure your reaction time with just a yardstick and some help from a friend. Rest your arm on the edge of a table or chair, with your hand hanging over the edge (this prevents you from dropping your hand down to match the yardstick's motion). 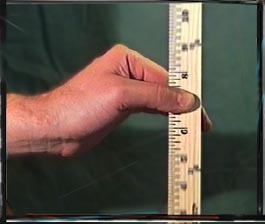 Hold your thumb and index finger about an inch apart, and have a friend hold a yardstick so that its bottom end is just between your two fingers. Without warning you, have your friend drop the yardstick and, as fast as you can, close your fingers on the stick. Note the inch reading where your fingers hold the stick. For most people, about six inches will have fallen through before they can grab the yardstick. This grab at 7 inches is good enough for a web developer but wouldn't cut it for a goalie. The average person usually catches the yardstick around 6-8 inches; this translates to a reaction time of .177 to .204 seconds. Thinking of going pro? Wait until you consider this next situation. Time = d/t = 20 ft/90 mph = 0.152 sec. For a reaction time like that, Hrudey would have to catch the yardstick at 4.5 inches. Maybe you'd better keep your day job.